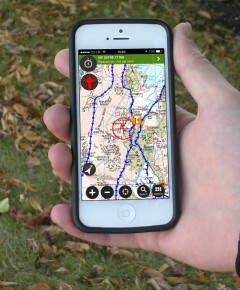 ViewRanger, the outdoor GPS app, has just got even better with the latest update - V4 for Apple iPhone and iPad. The all-new user interface has been optimised to make planning, navigating, tracking and sharing outdoor adventures ‘on the go’ easier and more intuitive. Recent research* has estimated that the adventure travel market is growing by 65% and was worth $263 billion in 2012. ViewRanger supports this activity by turning a phone into a fully functional off road GPS navigation system with access to the best selection of maps from agencies worldwide, including the latest Ordnance Survey maps at 1:25,000 and 1:50,000. It offers everything you need to find your way or record your trail as you go. It also provides the biggest collection of trail guides from a single source and an ever-growing library of crowd-sourced route guides from around the world. The upgrade has benefited from the feedback of ViewRanger’s global user community that ranges from occasional walkers, long-distance hikers, bike enthusiasts and horse-riders, to Antarctic explorers and mountain rescue teams. Co-founder Craig Wareham says; “Recent research* has found that 42% of all travellers participated in some type of experience tourism on their last trip. ViewRanger is designed to help them get more enjoyment from that activity and to share it with friends. “Although we originally designed ViewRanger to rival the best dedicated GPS devices, the benefit of being on a phone is that you also have access to a camera and an increasing variety of apps and social media. So we have further developed the app to exploit this social dimension. ViewRanger is used as a publishing platform by over 400 brands such as guidebook authors, tourism publishers, tourist boards and holiday organisers across the world. Recommended walks range from a London pub walk published by the Campaign for Real Ale in the UK through to the Okura Beach Walkway shared by New Zealand’s Wilderness magazine. Thousands of cycling, horse riding and winter trails are also available. ViewRanger is the app for adventure – it is how outdoor enthusiasts worldwide discover, create, navigate and share their outdoor adventures on smartphones, tablets and online. ViewRanger is also trusted by search & rescue teams and other outdoor professionals. ViewRanger is free to download for Apple iPhone, iPad, Android, Blackberry10 and Symbian devices and is fully functional with global mapping that can be stored offline and thousands of free trail guides are available. Additionally highly detailed topographic mapping sourced from national mapping agencies and premium publishers from most European countries, USA, Canada and New Zealand can be purchased in-app. ViewRanger pioneered the concept of outdoor GPS navigation on smartphones - going back to the delivery of the company’s first “app” in spring 2006. ViewRanger has achieved Number 1 Best-Selling app status (across all categories) on Apple iPhone and #1 app within its category on iTunes appstore in more than twenty countries. The app has also achieved multiple #1 ranking on Google Play and Nokia OVI app stores.